Get instant access to all the information you need for more than 200 medical-surgical conditions and procedures with the Clinical Companion to Medical-Surgical Nursing: Assessment and Management of Clinical Problems. Designed to accompany the 10th Edition of the Lewis main text, this portable reference has been completely updated throughout to reflect current practice. The Clinical Companion is organized alphabetically for quick reference and includes a variety of full-color illustrations and summary tables to help you digest information quickly. 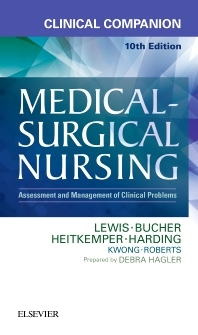 Cross-references to Lewis: Medical-Surgical Nursing, 10th Edition, make it easy to locate more in-depth information. Patient and caregiver teaching content highlighted with a special icon, identifying information to share with patients and caregivers. Reference Appendix contains information commonly used in nursing practice, such as abbreviations, laboratory values, and commonly used formulas.